2 0 1 8 • WRAPS • 27 KALEE CONNER Who Did That?!? 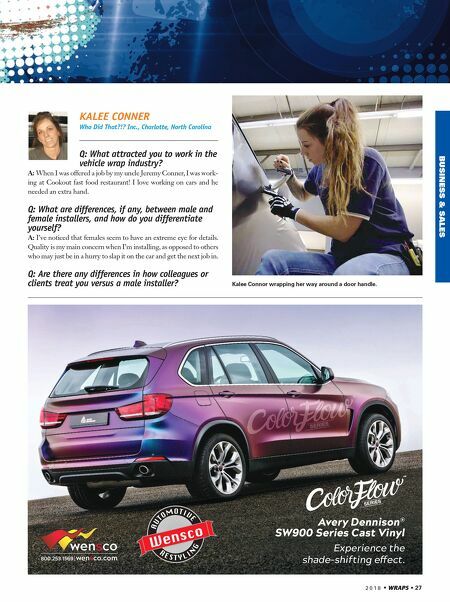 Inc., Charlotte, North Carolina Q: What attracted you to work in the vehicle wrap industry? A: When I was offered a job by my uncle Jeremy Conner, I was work- ing at Cookout fast food restaurant! I love working on cars and he needed an extra hand. Q: What are differences, if any, between male and female installers, and how do you differentiate yourself? A: I've noticed that females seem to have an extreme eye for details. Quality is my main concern when I'm installing, as opposed to others who may just be in a hurry to slap it on the car and get the next job in. Q: Are there any differences in how colleagues or clients treat you versus a male installer? Kalee Connor wrapping her way around a door handle. BUSINESS & SALES Avery Dennison ® SW900 Series Cast Vinyl Experience the shade-shifting e ect.